The Assassin's Creed: Unity DLC Dead Kings will be released on January 13, and in case you've forgotten, it will be free for everyone who owns the game. It was originally intended to be part of the season pass, but Ubisoft announced back in November that it would give the new content away as an apology for making such a mess of the game's launch. Dead Kings takes place after the events of Unity, when [mild spoiler warning] Arno leaves Paris for the mysterious city of Saint Denis, home to the crypts of past kings of France. There, he will face the Raiders, a new faction of enemies he stumbles across during his exploration of the caves and catacombs beneath the Basilica. 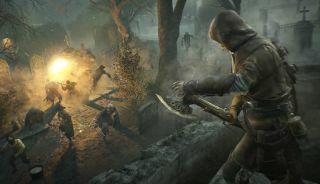 The expansion offers a full-on single-player campaign as well as new open-world activities and side missions, and new weapons, gear, and outfits, including the powerful Guillotine gun—basically a hand-cannon with an axe attached to it. And now, some screenshots. Enjoy!